Wow! 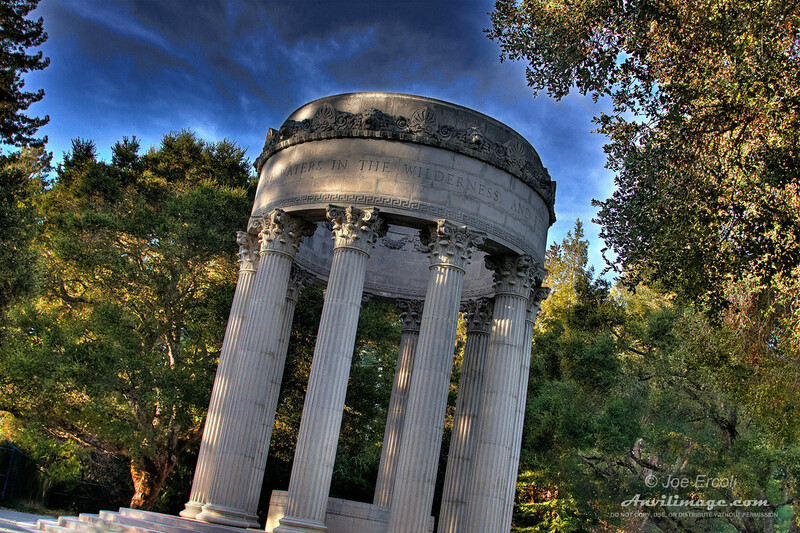 What can I say about the Pulgas Water Temple? I grew up nearby and it all started when I used to ride my bike through crazy backwoods trails to get there without my parents knowing and became a destination in my teens as the local street racing spot was right outside the gates. While searching the web to find out a little about the history of the water temple, I found a pic from the ’30s that showed the structure by itself on a spot completely devoid of vegetation. Looking at my pic and from being there, it is totally the opposite from what I’ve always known of that area. The Water Temple has always been some seemingly mystifying place to me. It sits on a two lane road in the middle of nowhere and appears out of thin air as you drive by. It’s not what you expect there. It seems like you’re visiting some weird fantasy world when you’re walking around there and I feel like I have to be quiet like I’m at a library. If you’re ever on the SF Peninsula, you should stop by to check it out if you have time to relax and just take it in. HDR Info: 5 RAWs combined with Photomatix and spot corrected with Photoshop by layered exposure blending. Shot on a tripod. This entry was posted on Friday, December 12th, 2008 at 1:59 am	and is filed under Blog, Photos. You can follow any responses to this entry through the RSS 2.0 feed.